"Someone's been eating my porridge, and they've eaten it all up!" 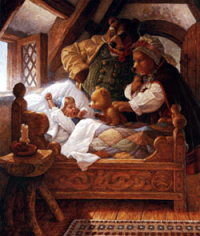 Goldilocks and the Three Bears is a popular children's fairy tale from England. The earliest known written account dates from 1831; the most influential is Robert Southey's from 1837, though in this version the antagonist is a vagrant old woman rather than a mischievous girl. It tells the story of three anthropomorphic bears and their encounter with a young girl called Goldilocks (after her golden hair). read more from Wikipedia . . .
"This porridge is too hot!" she exclaimed. "Ahhh, this porridge is just right," she said happily and she ate it all up. After she'd eaten the three bears' breakfasts she decided she was feeling a little tired. So, she walked into the living room where she saw three chairs. Goldilocks sat in the first chair to rest her feet. "This chair is too big!" she exclaimed. "This chair is too big, too!" she whined. So she tried the last and smallest chair. "Ahhh, this chair is just right," she sighed. But just as she settled down into the chair to rest, it broke into pieces! "Someone's been eating my porridge," growled the Papa bear. "Someone's been eating my porridge," said the Mama bear. "Someone's been eating my porridge and they ate it all up!" cried the Baby bear. "Someone's been sitting in my chair," growled the Papa bear. "Someone's been sitting in my chair," said the Mama bear. "Someone's been sitting in my chair and they've broken it all to pieces," cried the Baby bear. They decided to look around some more and when they got upstairs to the bedroom, Papa bear growled, "Someone's been sleeping in my bed,"
"Someone's been sleeping in my bed and she's still there!" exclaimed Baby bear. Just then, Goldilocks woke up and saw the three bears. She screamed, "Help!" And she jumped up and ran out of the room. Goldilocks ran down the stairs, opened the door, and ran away into the forest. And she never returned to the home of the three bears.